Even though building full-fledged cloud IT environments is a hot topic in IT party these days, there still are companies that, basically, cannot go all-cloud for some reasons. Some usually say that it is due to security and availability concerns, while others mention that management complexity also keeps them away from the cloud. So, being stuck with servers in their basements, these guys run production on hardware that often poorly scales out, cannot provide decent disaster recovery, and, what is more important, limits innovation. Everything changes when the hybrid cloud comes to the play: why picking any of the sides if you can benefit from them both! That’s, actually, what StarWind Virtual SAN and Azure enables you to do! 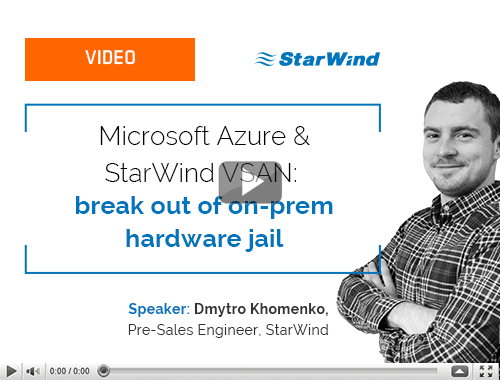 Learn from this video why and how to extend IT environment to Microsoft Azure with StarWind Virtual SAN.